What’s new with Disney in 2017. Opens in a new window. 3 best new attractions at Disneyland. Opens in a new window. Just outside of Los Angeles is the city of Anaheim, California, known around the world for its theme parks. The Southern California destination of Anaheim is all about family fun, and the majority of its attractions are suitable for all ages. 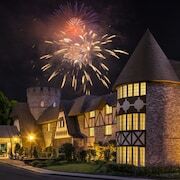 Of course, the biggest draw of a holiday in Anaheim is Disneyland®, the sprawling park boasting classic shows, parades, nightly fireworks, and thrill rides. Next door is California Adventure, the newest Disney® theme park that offers rides popular with older kids, teens, and adults. If you're a sports fan, pack your itinerary with a trip to see the LA Angels play baseball at the Angel Stadium of Anaheim and the Anaheim Ducks play ice hockey at the Honda Centre depending on when you visit. The Yorba Regional Park is a great place to escape the crowds momentarily and enjoy a sprawling playground, a beautiful lake, and miles of paved walkways. Swing by the Anaheim Farmer's Market to pick up fresh produce straight from local farms, or do some souvenir shopping at the Anaheim Plaza. While in Anaheim, you will also be just 20 minutes from Newport Beach, which means that swimming or even surfing in the Pacific Ocean is a definite possibility on your California getaway. 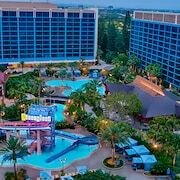 As you browse for Anaheim accommodation, be sure to check out our wide range of deals and discounts in Southern California. Here at Expedia.co.nz, we offer a variety of Anaheim hotels that can fit into any traveller's budget. 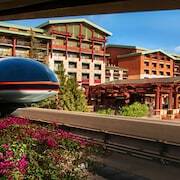 If you're looking for hotels near Disneyland® Anaheim, we've got great options that the whole family will love. 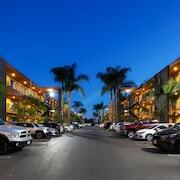 If you'd rather stay one of the motels close to the beach for that classic California lifestyle, there are plenty of affordable choices just minutes from Anaheim's attractions. Stay close to major stadiums or local shopping malls, or splurge on a luxury resort within walking distance of the best theme parks that Anaheim, CA, has to offer. The biggest international airport in the area is the Los Angeles International Airport (LAX), which is an hour from Anaheim by taxi, shuttle, or rental car. Closer but smaller airports include the John Wayne Airport (SNA), just 15 minutes from Anaheim, and the Long Beach Airport (LGB), which is 25 minutes away. Southern California's climate is warmest from July to August, when temperatures regularly reach 30 degrees. During the winter, approximately December through February, temperatures can still hover around 21 degrees, making the destination a popular spot to visit throughout the year. American summer holidays, typically July and August, will be the busiest times for Anaheim's theme parks. Right here at Expedia.co.nz, we are excited to pair your holiday goals with the perfect accommodation to make the most of your trip. If you're all about road trips, a hotel close to the highway lets you beat the traffic and explore more during your stay. If you are a Disney® fanatic, then access to the theme parks should be your primary goal. 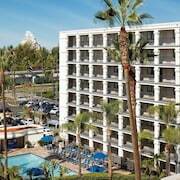 Whatever it is that you're looking for in Anaheim, we can offer at a fantastic rate. Our easy-to-navigate website even includes airfare and vehicles, should you want to rent a car in Anaheim. 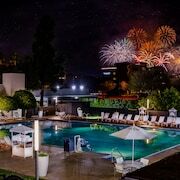 For incredible fun, the California lifestyle, beach access, and attractions for the whole family, Anaheim is an amazing place to pick for your next holiday. Explore Anaheim with Expedia.co.nz’s Travel Guides to find the best flights, cars, holiday packages and more!